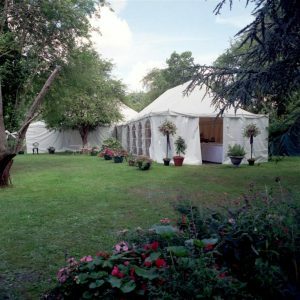 Here are some of the things you may be considering as you make your choice if a marquee wedding is for you. Space – You will be surprised how creative marquee companies can be and how little space you need to have a marquee wedding at home. The only other real consideration is available parking for guests. Seasons – Marquees can easily be heated, so really this is not an issue. I have done a marquee wedding for over 200 guests in the snow in February – just need to be more careful when it starts to melt. Costs – You do often need to hire more equipment than at a venue but whether working on a budget or throwing caution to the wind marquees are the best way to have full control. No hidden extras or fees for restrictions, the choices are all yours. Timings – The beauty of a marquee is that you can set it up to suit you, as it is the ultimate exclusive use. You will have full 24/7 access to it in the run up and the days after. So you can relax and enjoy seeing everything come to life and even throw a few extra parties while the space is there. Personalisation – This is the best reason a tent wedding is so special. You can have just about anything you dream of and create a day that reflects your personalities. I really think it creates an intimate space that is unique and allows all guests to smile and party. We specialise in marquee weddings so you will be in safe hands with Cherish. We are very happy to do a quick site visit and talk over the options is this is something you are exploring.